This week I have nice selection of mostly 1950's and 60's Vintage One Sheet Movie Posters featuring a host of top stars of the era. The One Sheets are all from the U.S.A. but some were printed in Spanish for the central and South America countries, plus there are a few which were printed specifically for the Military. Among the big names I have Marlon Brando in THE UGLY AMERICAN (1963) for which I have both a Military release and a Spanish Language one sheet poster, another Brando poster is THE TEAHOUSE OF THE AUGUST MOON (1956). Orson Welles stars in OEDIPUS THE KING (1968) plus I have two different Spanish language one sheets for IS PARIS BURNING (1966) which also features Glenn Ford who also stars in ADVANCE TO THE REAR (1964). I have a couple of Westerns including ROUGH NIGHT IN JERICHO (1967) starring George Peppard and Dean Martin, LAWMAN (1971) directed by Michael Winner and starring Burt Lancaster. Plus THE FOOL KILLER (1965) for which I have both the US one sheet and a set of 8 Lobby Cards. 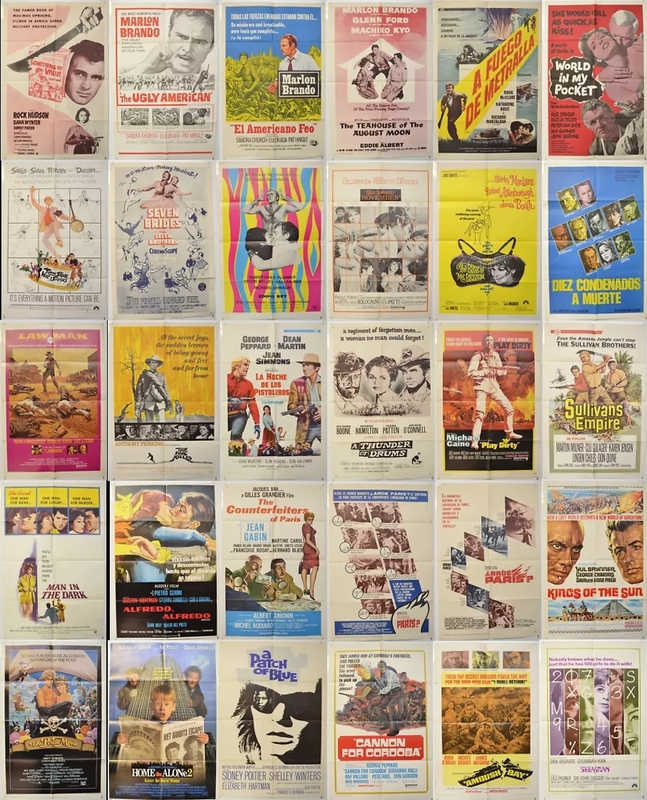 Rock Hudson takes the lead in SOMETHING OF VALUE (1957), Shirley MacLaine stars in THE BLISS OF MRS. BLOSSOM (1968) for which I have both the US one sheet and a set of 8 Lobby Cards. Auction ends Sunday 11th November 2018.